WILLIAMSPORT, Pa. – Two are Academic All-Americans. Three are Academic All-District picks. Three are all-region athletes and two of those were All-Americans. One was an NCAA statistical champion. 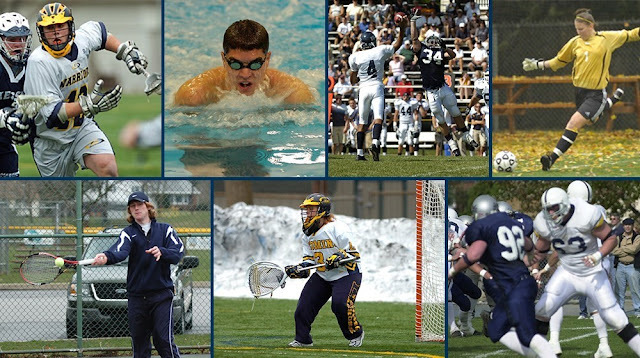 All seven earned all-conference honors in their careers and make up the 2017 Lycoming College Athletics Hall of Fame class, which will be inducted at the 32nd annual Hall of Fame Ceremony as part of Alumni Weekend, June 2-4, 2017. The complete class features Joe Andrie '12 (men’s swimming), Bobby Brown '11 (men's tennis), Jessica (Bennett) Brusgard '08 (women's soccer), Mike Doherty '10 (men’s lacrosse), Kristina (Peacock) Manciocchi '08 (women's lacrosse), Matt Mendola '04 (football) and Ryan Yaple '08 (football). The group will be inducted on Saturday, June 3, at 3 p.m. in Lamade Gym. A reception will follow the ceremony in the Recreation Center Atrium. To sign up for the Hall of Fame ceremony, please visit the Alumni Weekend website at: www.lycoming.edu/alumniWeekend/. Andrie, a 2012 Third Team Academic All-American, was a seven-time Second Team All-MAC breaststroker and a member of seven more all-conference relay teams. A 2011 Second Team All-District and a 2012 first-team selection, he was a huge factor in the pool for the Warriors during his four-year career. The Reedsville, Pa., native set the 100- and 200-yard breaststroke records as a freshman and broke both as a junior. Those times as a junior of 2:15.15 in the 200-yard breaststroke and 1:01.54 in the 100-yard breaststroke are still in the top five in school history. A two-time captain, he earned the 2011 Sol “Woody” Wolf Award, which is given to the Lycoming junior student-athlete who shows the most improvement in their first three years. He was also named a MAC Scholar-Athlete, the conference’s highest individual honor given to a graduating conference senior with the highest athletic and academic achievements. Before graduating with a bachelor’s degree in biology, Andrie reeled in several campus awards, including the school’s top honor, the Chieftain Award in 2012. After graduating, Andrie went on to Penn State’s College of Medicine, graduating in 2016. While there, he served as a volunteer coach with the Special Olympics Swimming Team in Hershey and also assisted Bellefonte Area High School’s team for a season. He has transitioned from the pool to other outdoor events, including competing in a sprint triathlon and a Tough Mudder competition. As a doctor, he has also stayed involved in athletics, providing coverage at Pittsburgh-area high school football games and Penn State rugby and women’s volleyball matches. He is currently a resident physician in family medicine at the University of Pittsburgh Medical Center-St. Margaret. During his four years at Lycoming College, Brown helped lead the men’s tennis team to 24 wins, more than the team had won in the 17 years before he had joined the team in 2008. A three-time First Team All-Commonwealth Conference selection, the Montoursville, Pa., native was a Second Team Academic All-American selection. He earned his first all-conference honor as a sophomore and added another as a junior after helping lead the Warriors to the team’s first conference title in school history. That year, the team finished 10-3 overall and earned a spot in the NCAA Tournament for the first time, with Brown leading the way, posting a 5-7 record at No. 1 singles and a 12-3 record with his brother, David, at No. 2 doubles. As a senior, Brown, after playing at the No. 1 position for the last three years, moved comfortably into the No. 2 position, where he finished a perfect 6-0 in Commonwealth Conference play. He posted a career-best 8-4 record in singles play and surpassed 50 career combined wins (singles and doubles) during the season, along with winning the Commonwealth Conference Player of the Week award once. In doubles play, the Brown brothers formed one of the top duos in the conference, as the pair advanced to the finals at the MAC Individual Championships in the second flight for the second straight year and they combined to post an 11-4 overall record and a 6-0 conference slate. He also earned the conference’s MAC Scholar Athlete award. Off the court, he was a three-time member of the MAC Academic Honor Roll and earned the Intercollegiate Tennis Association’s Scholar-Athlete status twice. An astronomy and physics major at Lycoming, Brown also showed a love for computer science and web development during his time at the college. After graduating, he continued to work in that area, serving as an assistant website programmer with Sage Age Strategies and he also stayed involved with the tennis program, assisting the men’s team in 2012. He also served as webmaster and social media coordinator for the Lycoming Animal Protection Society. In 2013, he returned to Lycoming College as the school’s Web Developer and he married Rebecca Reynolds ’11, a four-year letterwinner with the women’s tennis team, that year as well. 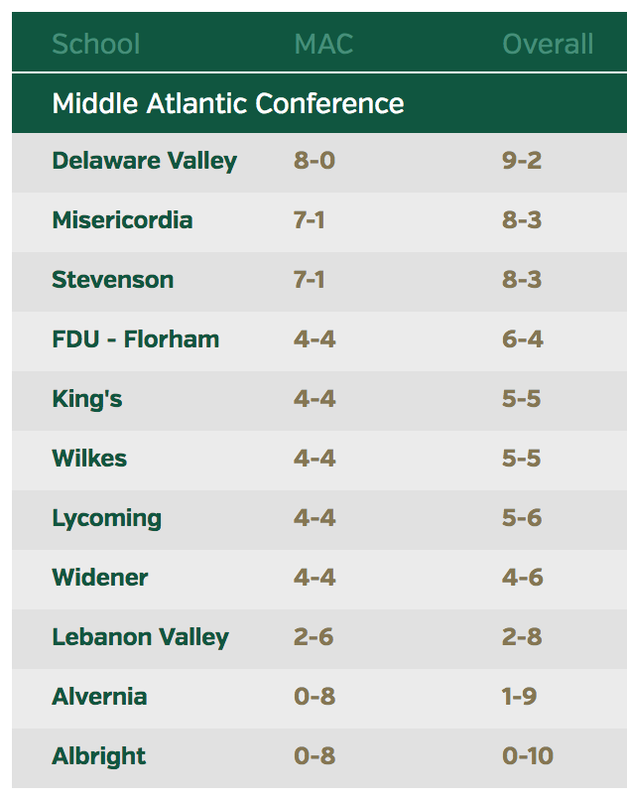 The Lycoming College women’s soccer program experienced a renaissance of sorts in 2004, as the team won 12 games and experienced its first winning season in six years. The five-win improvement from 2003 was in no small part due to Bennett, the team’s freshman goalkeeper. The rookie was absolutely tremendous in goal, making 99 saves and posting an .846 save percentage. She set school records with 12 wins in the season and a 1.11 goals against average, as the Crofton, Md., native earned First Team All-Freedom Conference honors. Bennett notched 108 saves as a sophomore and continued to start in each of her four seasons with the program, never posting a save percentage of lower than .750. As a senior, she posted a 1.14 goals against average and led the team to a 9-8 record in its first year in the Commonwealth Conference, wrapping up her career with second-team all-conference honors. In all, Bennett holds career school records for wins (32), goals-against average (1.59) and shutouts (17) and she also set a single-season mark with five shutouts, in both 2004 and 2005. A three-time MAC Academic Honor Roll selection, Bennett also earned Third Team Academic All-District honors as a sophomore in 2005. After graduating sixth in her class with a degree in biology, Bennett moved on to a Ph.D. program at the University of Maryland, Baltimore, where she finished with a degree in Molecular Medicine with a specialization in cancer biology in December 2014. Bennett currently works as a biomedical life scientist with Leidos in Frederick, Md. She has stayed active in soccer, playing indoor soccer and outdoor soccer with coed recreation teams throughout the year. She also served as a trainer for the Damascus Spirit 96 club team for three seasons, during which time she earned her USSF National D Coaching License. Also an active runner and cycler, she has competed in several half-marathons, triathlons and Tough Mudders, while also becoming an avid surfer and paddle boarder. She married Eric Brusgard in 2012 and the couple reside in Odenton, Md., with their lab/retriever mix Nani. From Berlin, Md., Doherty made a difference from the first whistle he heard to the last, winning faceoff after faceoff, giving the team nearly two times as many possessions off the draw than his opponents got. A starter from the time he entered Lycoming College, Doherty was key in turning the program around. After winning 53 percent of his faceoffs as a freshman, he led the team to a six-win improvement as a sophomore. At the circle, he was unstoppable, winning a school-record 68.8 percent of his faceoffs and picking up 11.06 groundballs per game (a school-record total of 177) to lead the nation. His faceoff percentage was third in the country. As a junior in 2009, he won 64 percent of his faceoffs, 15th in the nation, and scooped up 8.3 groundballs per game, the ninth-most in the country, and he helped the Warriors finish first in the MAC’s regular season standings for the first time since 2001. As a senior, he won 67 percent in the circle, finishing eighth in the nation for his second top 10 finish, and scooped up 7.79 groundballs per game, 14th-best in Division III. In all, Doherty earned two All-MAC citations and was named an Honorable Mention Inside Lacrosse.com Preseason All-American twice while the team won 36 games and reached the MAC playoffs three times. He finished his career ranked in the top five in school history in four career categories, including holding the all-time record for best faceoff percentage (.642). Since graduating, Doherty has moved on to work with Interior Specialists, Inc., also known as ISI Demolition, where he is a project manager. He has helped coach several youth lacrosse teams in the Maryland area before moving to Florida for ISI. He is engaged to Alex Engh and will be married in April. The backbone of one of the most successful four-year periods in program history, Peacock led Lycoming college holding school records with 693 career saves and 39 wins. A four-year starter, Peacock went 39-19 in her career, winning a school-record 14 games in both 2006 and 2007. She helped the team to three appearances in the MAC playoffs, including one appearance in the conference title game in 2006. She was a two-time Second Team All-MAC selection and earned Second Team IWLCA All-Metro Regions as well as a sophomore. The womenslacrosse.com Player of the Week on March 28, 2007, Peacock also established a school record by earning five MAC Defensive Player of the Week awards. The only goalkeeper in school history to post two 200-save seasons, Peacock is third in school history with a .541 career save percentage and second with 11.18 saves per game. After her senior season, the Webster, N.Y., native was also selected to participate in the IWLCA North/South All-Star Game - one of just three players in school history to compete in the prestigious event. After graduating, Peacock moved back to the Rochester, N.Y., area where she is a business analyst for Paychex. She is married to Jeff Manciocchi and has a two-year old son, Zachary, and another son due in March. The ninth All-American offensive lineman in program history, Mendola was a strapping 6-6, 282 pounds by the time his senior year rolled around. Protecting the blind side as a left tackle, the Dunmore, Pa., native was a three-time All-MAC selection, earning first team honors in 2002 and 2003 and second-team accolades in 2001 while helping the team to a 30-8 record in his career. A four-year letterwinner and three-year starter, Mendola began to step into a national spotlight as a junior, when he was a part of the only offensive line in program history to earn D3football.com Team of the Week accolades. As a senior, he was a part of a Warriors’ squad that posted a 9-2 record, won a MAC title and reached the NCAA Tournament quarterfinals. After the season, he earned his second all-region accolades from the Don Hansen Football Gazette and earned 2nd Team All-American accolades from that publication, third-team honors from the SID All-American list and honorable mention accolades from D3football.com. He also participated in the Aztec Bowl in 2004, competing with a Division III all-star team against a Mexican football squad. After graduating, he continued to play football, playing with the Arena Football 2 Wilkes-Barre/Scranton Pioneers in 2006. He also began his professional career, obtaining an associate degree in surveying technology from Penn State, helping him move into the family-owned Mendola & Associates, P.C., where he is now the vice-president. He is a professional land surveyor in Pennsylvania, New York and New Jersey. He is married to Laura (Heintzelman) ’04 and the couple have three children. One of the best pass rushers in program history, Yaple transitioned to the defensive line as a junior and made an immediate impact. A four-year letterwinner, Yaple appeared in just 14 games in his first two years, but a sophomore season where five of his 12 tackles were for loss was enough to get the Warrior coaching staff to realize the benefits of moving the 6-0, 225-pounder to the front lines. As a senior, he finished second in Division III with 14 sacks. He posted 19.5 tackles for loss during the season, which placed him in the top-ten nationally and is the seventh-most in program history. He had 44 tackles in 2007, two pass breakups and a forced fumble. After the season he earned First Team D3football.com All-East Region, First Team All-MAC and Honorable Mention D3football.com All-American honors. He finished his career 14th in program history with 30 tackles for loss and 17th with 17.5 sacks. The Stillwater, Pa., native was also named a National Strength & Conditioning Association All-American Athlete of the Year and began his professional career in 2008 by serving as an assistant coach with the 2008 Middle Atlantic Conference champion football team. After finishing his year as an assistant coach with the Warriors, Yaple moved to Fort Worth, Texas, where he is an engineer and driver with the Fort Worth Fire Department. He was promoted from firefighter in August after earning the top score on the promotional test, which was given to more than 100 fellow firefighters. He still maintains an active workout regimen, earning the fire department’s physical fitness award during the eight-month training academy. He and his wife, Rhea, reside in Brock, Texas.